Decks are amazing, and many people want one on their house. Building one that meets your particular situation, however, requires planning and appreciating the problems with decking that can arise. You can’t simply start slapping decking materials together, or you will wind up with an uneven mess on your hands. Instead, you can work to prevent problems with decking and the associated trouble at the start by using the right materials. You will have to take the following points into consideration to do this. 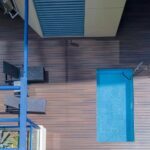 Wood as a decking material can be beautiful when you first install it, but, as an organic material, it is prone to rot. All it needs is oxygen, to have a moisture content above 28%, and to be in the right temperature range (which is wide, from 4 degrees Celsius to 40 degrees Celsius), and fungi will start making a meal of your deck. This is why regular waterproofing is required to keep a wooden deck nice. Even if you stave off the rot, there is the problem of warping. Even pressure treated wood absorbs water and expands. Then it dries off and shrinks. This movement causes boards to bend out of position, slowly working free of nails and other boards. The cycle of wet/dry also causes the grain to rise, cracking finishes and letting in more moisture. These are incredibly common problems with decking. Composite decking, which is made from thermoplastic resins and wood, doesn’t invite fungi, since it can’t eat plastic. However, if the composite wood is uncapped, it can still warp from rapid contraction and expansion cycles. This is caused by heat. Fortunately, capped composite decking resists warping and rotting as the capping keeps it from moving and the resin repels water. When you make the plans for your deck, you will want to take into consideration how much time and effort you are willing to invest in maintaining the appearance and structural integrity of your deck. After all, no matter how you initially you make your deck, it can crumble well inside of a decade if it isn’t properly cared for. The first steps you will have to take to ensure the long life of a wooden deck is to sand and seal the material as soon as it is built. This will help repel moisture, thus delaying rot. Try to avoid applying the finish when it is really hot out, as this will cause the seal to dry too quickly and leave a spotted appearance. Once the deck is completed, you will have to annually clean the deck with a deck cleaner. You will also have to reapply the sealant or stain once a year, which will include lightly sanding the deck surfaces with 80-grit sandpaper before applying. This can take 2 days as the sealer needs time to dry. 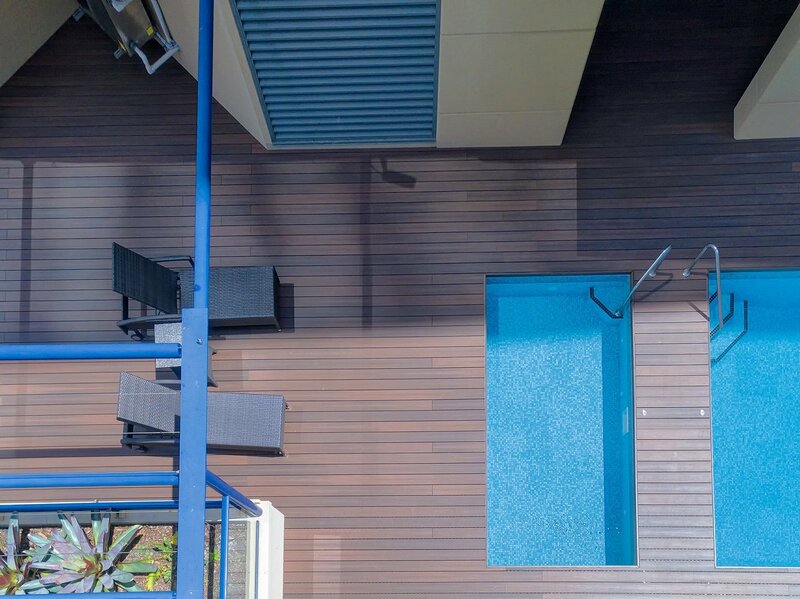 Composite decking doesn’t require sealant, so you can skip the sanding and finishing. However, if the composite decking that you chose doesn’t have a non-porous surface layer (capping), it can easily get stained. You will have to scrub it with cleaners designed for composite decking to remove them. If, on the other hand, you have capped composite decking, you don’t need to worry about any of these common problems with decking. Forget staining and you can spray off any spots with a power washer or normal soap and water. It won’t rot, so you won’t have to inspect for that either. Asides from regularly having to check wood for rotten wood, you will have to regularly inspect for exposed or popped nails. Warping causes nails and screws to come loose, and the elements can cause the metal parts to rust out, leaving your deck seriously weakened. There are capped composite decking systems that come with marine grade stainless steel fasteners that attach the boards to the sub-frame via grooves on the sides of the boards so that you can avoid loose dangerous nails all together. Splinters are the next area of concern for anyone who likes to walk on the deck barefoot. Wood that has been exposed can start to fall into shards, which can get into bare hands and feet. Capped composite decking doesn’t splinter, so that isn’t a concern. The sun is not the friend of wood or uncapped composite decking. Dreaded Australian UV rays cause the surface fibres to decay, making their pretty exteriors loose their lustre. The uncapped composite decking fades in colour while wood eventually turn grey if not properly treated. The only way to combat this with wood is to choose a finish that specifically resists UV radiation, though even these finishes stop working after a while. You can cover uncapped composite decking with a finish, too, though the material doesn’t absorb stains well. You might go for a sun shade as a bit of added protection, but it can’t cover everything all the time. The sun moves and the shade goes with it, leaving portions exposed to UV rays. Look specifically for Capped Composite Decking that offers a Stain and Fade Warranty for long term piece of mind. Termites and carpenter ants are big fans of wood. Termites home in on rotten wood and eat it while they build tunnels in it. Not only does this weaken your beautiful wood deck, but it leads to unsightly little white ant creatures crawling around the rest of your home. Carpenter ants, on the other hand, won’t eat wood. No, they will just cut out galleries in the rotten wood, leaving sawdust and destroyed decking in their wake. If you get wood for your decking, you will have to keep the bugs in mind. You will have to keep plants trimmed back from it to slow mould and rot and to make it harder for pests to climb on your deck. You will also have to be very quick to replace anything that is rotting so that you don’t provide a meal for the bugs. Composite decking doesn’t become food for bugs, so you can leave the plants near the deck if you use it. Fortunately, many, if not most, of the problems with decking and other considerations on this list can be avoided if you pick capped composite decking with a long stain and fade warranty. If you have any questions about capped composite decking, please contact us. We would love to find out if it is the material for you.